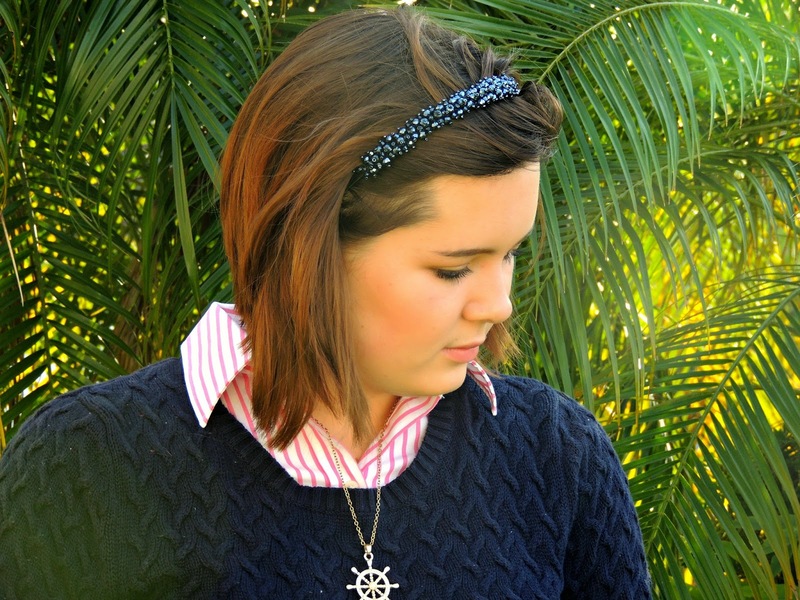 Juliana Grace Blog Space: Pink and Navy Fashion Friday.. Pink and Navy Fashion Friday..
Good evening and HAPPY FASHION FRIDAY everyone! I hope you are all doing great and looking forward to a fantastic weekend. I will be babysitting this weekend and getting in a good bike ride and workout possibly. Is anyone else ready for spring break? I am counting down the days to break and I have a lot of great posts planned! You will have to wait and find out :) Sadly, that is a month away but Valentines is coming up soon so I want to hear what your plans are. I will probably stay in with a friend or two as we enjoy treating ourselves to some sweets and a chick flick, anyone with me?? 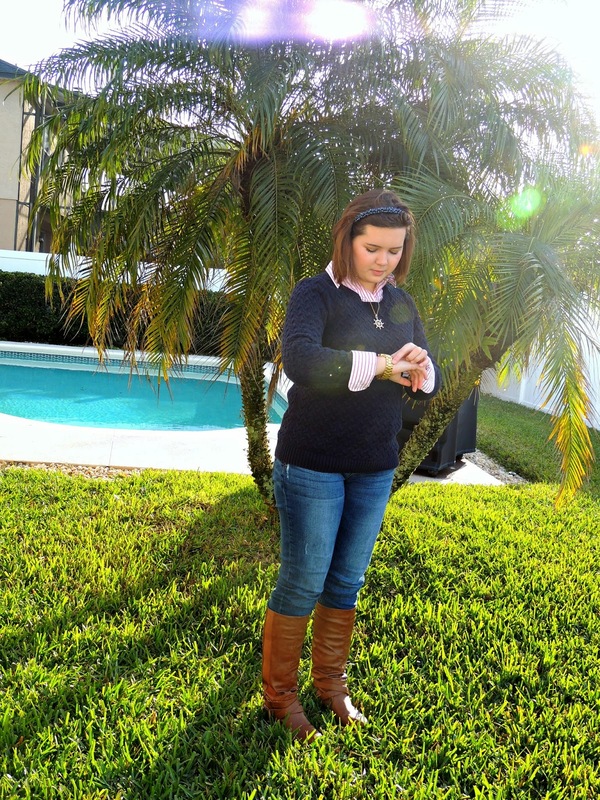 Todays outfit I really like because pink and navy are my two favorite colors, and I love them together. Why not layer them right?? 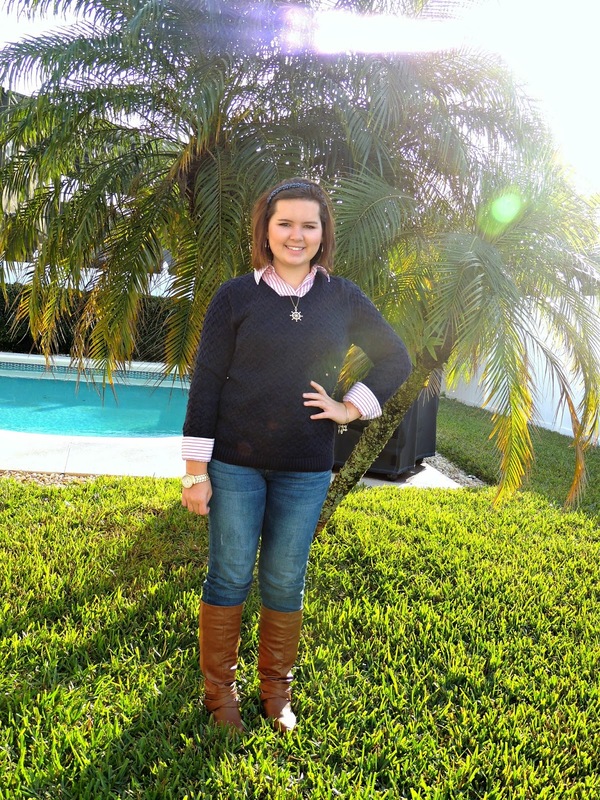 Both the striped shirt and sweater are from the Chaps collection in Kohl's so make sure to check them out. That is where I get all my layering pieces. I linked them in my last post which was my January favorites, so check that out as well. My necklace was a gift from a friend that she got at Charming Charlies, a HUGE and amazing accessory store. My headband is from Ulta and my brown riding boots are from a JCPenny sale. Enjoy your weekend! Comment below or email me with any thoughts or questions. Goodnight! Aw thank you! I have really been trying to do more with my hair so I bought a few headbands and this is one I have been loving! Glad you enjoyed! Oh thank you! This is my favorite color combo, I am glad you like it... Thanks for the comment! Nice look. I love your shirt and headband. Answering your question, I use a Nikon D3100. My boyfriend is my photographer, so sometimes the photos look better than others. Oh awesome! Thanks for getting back to me. Oh thank you! I usually love my monogram necklace or big statement necklaces but this one has to be one of my favorites. Glad you enjoyed!